Today in the Armies of Australian Masters 2017 series we have Goblin force led by the current 1st player in the rankings - Clint. Clint also holds the "Most tournaments played" award as he attended eleven events this year during which he played with various armies. Most recent two saw his Goblins unleashed and he decided to take this army to the Masters. This army has 19 elements total which may not be much for the Goblins but it is definitely impressive for other armies. Three hordes of trolls form the main axis, war trombones and rocks thrower provide flexible ranged support, Mincers add greatly to the melee potential and Mawbeasts are impossible to ignore! the environment they live in. However, all Trolls have dim wits and an insatiable appetite. Trolls are very good units because they combine good defensive capabilities in the form of Defense 5+ and Regeneration 5+ with good melee potential due to significant number of attacks at Crushing Strength (2). Hence, they can be called upon both, for defending the area and to press hard against the enemy. 6 x 10 Mawbeasts Pack - The Mawbeasts are ferocious critters goaded into battle by their Goblin handlers. The large number of Mawbeasts Packs is what is probably the first thing the opponents notice. Not as fast as other types of cavalry, they are quite maneuverable and despite being a bit fragile, they can hit significantly hard not to be ignored. At the same time they are also perfectly expendable. 10 Fleabag Riders - Goblins give the name ‘Fleabags’ to any beast they manage to tame enough to ride: giant rodents, ferocious wolves or even horrid giant bugs. Faster than Mawbeasts and hitting similarly strong, they also sport a bit of a better armor. Looks like large number of Mawbeasts requires mounted herders! Not to be underestimated, in particular if allowed to sneak in to the flank or rear. 3 x Mincer - The Mincer is essentially a carriage powered by the frantic labour of Goblins or a small steam engine. The rear sports a large counterweight, necessary to offset the huge weight of the Mincer itself, a large, cone of counter-rotating segments. A very interesting device that is an interesting combination of good (although less predictable) melee potential, very good defense in the front arc, infantry like speed low nerve. Can really make a difference if allowed to charge, on its own against small units and aiding the main battle line against tougher opponents. 3 x War Trombone - Certainly less reassuring than a sharpstick thrower because of its considerably more limited range, the war-trombones are still quite popular because these huge wheeled blunderbusses can unleash terrible destruction amongst the enemy. 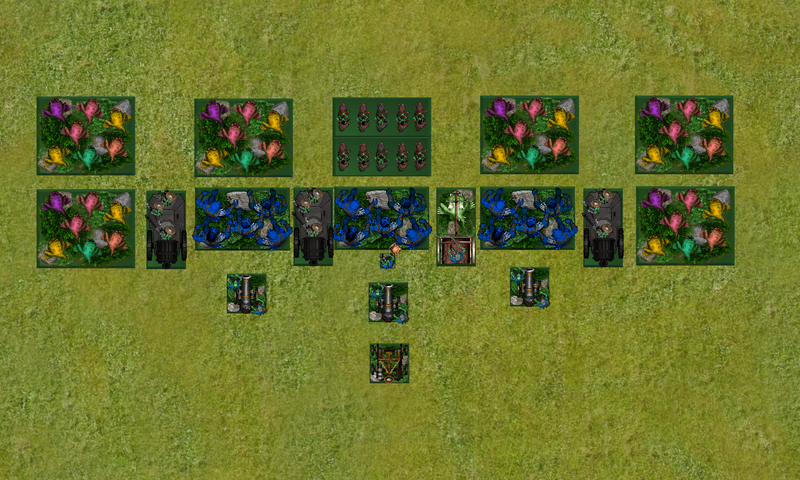 Very good ranged support with effective range 17", it will nicely aid Trolls main battle line. It can make any charger nervous and guards the back yard preventing enemy fliers from landing behind the other units. Big Rocks Thrower - Crewing one of these catapults is the ultimate fun for a Goblin, as the great cheers that accompany each shot can attest. Long range support. It may not hit often but cannot be ignored either and disrupting enemy plans like that is already a good thing for the Goblins. King on Chariot - This King likes to ride in style, it’s also quite good for fleeing at speed. Main source of Inspire presence, the King can also add a bit to the inevitable melees. As long as he is allowed to charge in the open he can be quite dangerous too. Flaggit - The job of carrying one of the sorcerous Wizbanners is very sought-after, as it involves staying well away from the enemy. The role of this sidekick is straightforward, wave the flag as vigorously as possible so that the nearby units know the King is nearby! Please, let me know what you think about this particular force!